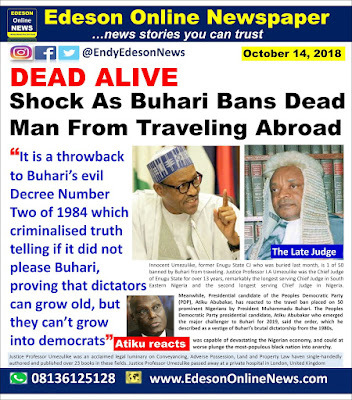 Innocent Umezulike, former Enugu State CJ who was buried last month, is 1 of 50 banned by Buhari from traveling. Justice Professor I.A Umezulike was the Chief Judge of Enugu State for over 13 years, remarkably the longest serving Chief Judge in South Eastern Nigeria and the second longest serving Chief Judge in Nigeria. National Judiciary Council, NJC, in 2016 following petitions against him by an Enugu based lawyer. He was later dragged to High courts in Enugu and Port Harcourt by the Economic and financial crimes Commission, EFCC, and his bank accounts frozen over some of the allegations that brought about his forced exit from the Bench. Meanwhile, Presidential candidate of the Peoples Democratic Party (PDP), Atiku Abubakar, has reacted to the travel ban placed on 50 prominent Nigerians by President Muhammadu Buhari. The Peoples Democratic Party presidential candidate, Atiku Abubakar who emerged the major challenger to Buhari for 2019, said the order, which he described as a vestige of Buhari’s brutal dictatorship from the 1980s, was capable of devastating the Nigerian economy, and could at worse plunge the most-populous black nation into anarchy. 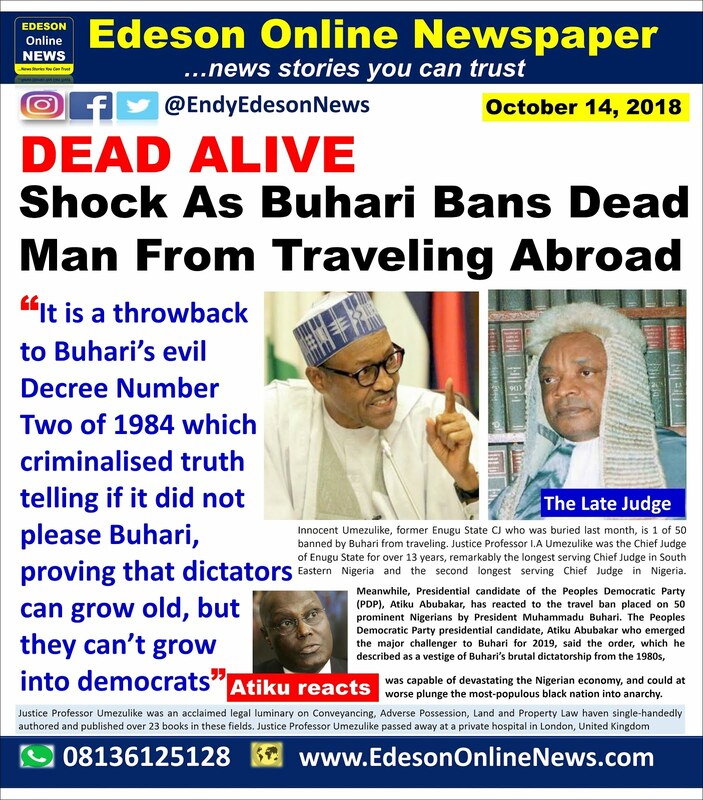 It is a throwback to Buhari’s evil Decree Number Two of 1984 which criminalised truth telling if it did not please Buhari, proving that dictators can grow old, but they can’t grow into democrats. The man in Abuja (D so called buhari) is just playing the script written down by the original buhari before he (original buhari) passed on. So much for a list, that's yet to be released. Hausa pple, what do u have this? But are also aware that the issue have been on ground for almost 7 years. Pls where is the full list ......... Make i check my name?